These swimming pool games for preschool kids are perfect for a special day like a birthday pool party but can easily adapted for other occasions and family time. Water can be a wonderful, magical playground. Preschool kids love exploring this world and have great fun splashing, jumping and playing. Let us know which ones work well for you and feel free to add your own in the comment box below. Water is perfect for play but it can also be extremely dangerous. Here are the main safety measures you need to follow and teach the kids to keep everyone safe and happy. For bigger pools and groups have one person supervising from the side and one IN the pool to be safely at hand. This is especially important for younger kids. For parties make one adult the Pool Watcher to watch the pool at all times. Be Alert! Think ahead and assess and preempt risky situations like dives, slippery pool edges or lively games. 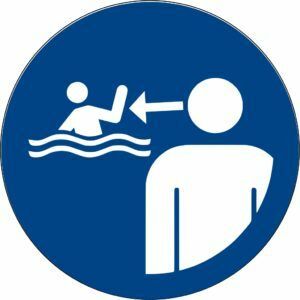 Mark off the deep and shallow end for non-swimmers. Extra Safety tips for young children. Some kids love being under water (I know because I was one of them ) and others are more cautious and do anything to keep their face above water. If you plan any games with children other than your own do keep in mind that children develop at different paces. 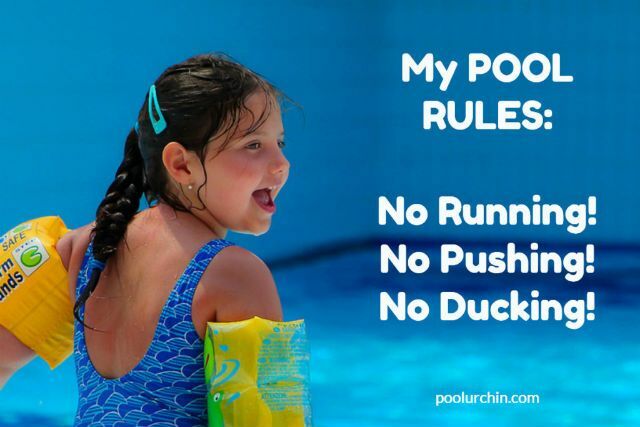 You can easily have an energetic, fearless 3 year old jumping into the deep end and happily doggy paddle back to safety while a shy 5 year old might insist on lowering himself cautiously into the pool using the steps. Make sure kids have a break after 30 min at the latest. Have an adult within arms reach all the time. Truth is, kids usually love the pool so much they can easily entertain themselves and keep inventing their own games. However, just to make this more of a special day or in case the mood is flagging a little or the kids don’t know each other that well, here are a few ideas to help you out. The games themselves are pretty easy. It’s your imagination that will add even more spice and fun into the mix. We also give you a few ideas to vary the games but as long as you match the difficulty with the skills of your little party guests you’ll be fine. You need: A large bag of ping pong balls or balls from a ball pool pit, about 10 per participants, so for 4 children about 40 balls. A basket, bucket or bowl for each child to collect the balls. How to play: Put all the balls in the pool and a bucket for each child on the edge of the pool. Make sure each child knows which is theirs. The children then need to collect as many balls as possible until there are none left in the water. The child or team with the most balls wins. Variation/ Level Up for older children: Mark the balls with numbers 1-5. Add up the total instead of just counting the balls to find the winner. You need: A transparent plastic bottle with a white cap, label removed. How to play: Fill the bottle with water so it can sink. Children stand with their back to the pool. Explain that when they hear the bottle splash they can go and search for it. The first to find and hold the bottle up is the winner. This game is not as easy as it sounds but great fun for the kids. Don’t be surprised if they want to do it over and over again. Variation: For older children use a baby blue cap making it even harder to find. You need: A number of plastic or rubber toy figures that sink, or diving toys. Marbles and real coins work well for kids who really like a challenge. A basket, bucket or bowl for each child or team to collect their treasures. How to play: Decide the teams or let each child search for themselves. Throw the “treasures” in the pool. For young children let them see the treasure beforehand. They’ll find it difficult otherwise to search for something they don’t know. For older children put the figures into the pool while they are distracted with something else. Or let them line up with their back to the pool to add a bit of suspense while you throw in the treasure. Shout “Go!”. Kids have to collect all the treasures. The winner is who collects the most. Variation: It doesn’t have to be competitive. It can also be a group challenge to find and collect all treasures. Tip 1: Count how many items you have beforehand and let the children know the number so everybody knows when the game is over. Tip 2: Make sure the search area is well marked so kids don’t go too deep. How to play: Divide into two teams. The teams are at the side of the pool while the flotsam floats in the middle. The teams’ task is to collect as much objects as possible and bring them to their “island” (side of the pool). Players are not allowed to steal or push each other. The team with the most items wins. Three year old kids are usually more focused on themselves to get the task done rather than whether someone else is faster or slower. For them it’s more about “making it”. Five year olds on the other hand can get very excited about races of any kind. How to play: Kids have to carry their object to the other side of the pool keeping it dry. Telling an imaginative story to fit your party theme will make it even more fun. The objects could be precious treasures being transported from one island to the next in a pirate theme or magic pieces that loose their magic when they get wet…you get the picture. Level up for older kids: Use a foam kickboard board or spoon instead of hands. A floating board could be carried (easier) or be pushed carefully over the water. Experiment first! How to play: Kids stand on one side of the pool, a ball or small beach ball (10 to 15 inches in diameter) in front of them. They have to guide the ball across to the other end without using their hands. Originally, the game is to only use your face but for 3 year olds you could change this to using their tummy. Winner is the first person or team to finish. Variations/ Level Up: Older kids can go back and forth (the ball has to touch the other side before coming back). For a larger number organise this a relay race, the ball has to touch the pool side first before the next person takes over. Kids hug the ball tightly and kick across to the other side. How to play: Divide players into two equally strong teams. Players line up next to the first person to race on one side of the pool. There are several rounds for a full race. Each round has to be raced in a different fashion. The goal is to race the distance (to the other poolside and back) one after the other. Winner is always the team who finishes the round first. 4 or 5 rounds is is usually enough. 2. Running whilst pushing a kickboard. 3. Running sideways or backwards. 4. Running and boxing a ball through the water. 5. Running while holding the hands up in the air. 7. Squatting down so only the head is above water. Using a slippery, heavy watermelon instead of lightweight foam toys or inflatables makes a surprising change for the kids. How to play: Divide the kids into two teams. The first kid of each team stands at the side of the pool with a watermelon in front of him. Shout “Go!” and kids push their melon over to the other side and back. He must not carry the melon. When they reach the other side the next team member pushes the melon back and so on until all kids had their turn. The first team to finish is the winner. It seems almost no one is too young to play an aim and shoot game and pool basketball is no exception. It’s best to adapt the game for 3 to 5 year olds, though, because they are a bit too young to play this as a team sport. Plenty of balls in two different colours – balls from a ball pool pit are brilliant for this. How to play: Each team lines up to one side of the pool. Tell each team their color. The balls are scattered on the water. Players need to get their balls as quickly as possible into the hoop. The first team to do this is the winner. How to play: Use two players per raft, have them position themselves at opposite ends of the raft. Whilst kicking as hard as they can the players then try to push their opponent backwards. The winner is the player who manages to push his opponent back by 2 to 3 feet. How to play: The parent is the crocodile. S/he glides through the water and tries to catch the kids to throw them in the air. Being a polite crocodile he first asks whether the kid wants to be thrown in the air or not. For some kids the thrill of the catch game is plenty enough, but being thrown into the water might be too much. This can also be a great game at the end of the party. Caught children are being carried to the poolside and aren’t allowed back in. How to play: You need at least 2 members per team. One child is standing outside the pool next to the bottle waiting for their teammate to throw a wet sponge. The sponge is sqeezed out to fill the bottle and thrown back while other teammates throw the next wet sponge out etc. The winner is the team with the fullest bottle after a set time. 5 min is a good start, but you might have to adjust according to players speed and ability. Variation: Each team member has a sponge and races back and forth between pool and bottle. This is better for little children who can’t really throw yet. Older children on the other hand love the splatter and thuds of wet sponges flying around. How to play: Each team is standing next to their pile of items. On “Go!” they have to transport the pieces to the other side but the objects have to stay under water all the time. If an objects bounces up the player has to go back to start. First team to have all objects on the other side wins. How to play: Divide into two teams. The teams form two parallel lines with members of each team standing side by side to form the “conveyor belt”. The buckets stands on one end of each conveyor belt. The player on the opposite end of the conveyor belt has one kickboard and one cup. Give the start signal. The first player fills the cup with water and puts it on the board. The board is then pushed by one kid after the other to the end of the line and emptied into the bucket. If the cup tips over before reaching the last player in the line it has to go back to the start and filled again. Winner is the team to have the most water in their bucket when the time is up.